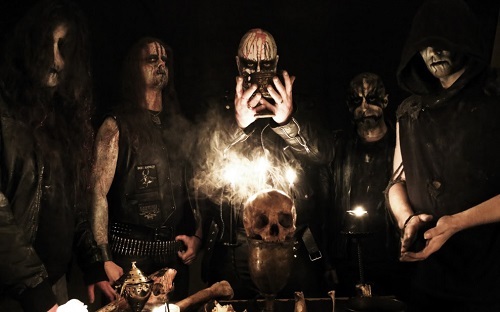 Belgium’s black metal traditionalists, ENTHRONED, have teamed up with Noisey to launch a second new track “Of Shrines and Sovereigns”, from the band’s upcoming full-length album “Sovereigns”. Stream the new song today at: http://noisey.vice.com/blog/enthroned-of-shrines-sovereigns-from-sovereign-LP before the release hits stores onApril 15 worldwide via Agonia Records. The follow up to the critically acclaimed “Obsidium” (2012) drifts from sonic blast beats to oppressive slower parts, melds together aggressive shredding with forceful riffs, and blends satanic whispers with Nornagest‘s trademark vocals. On the whole, band’s 10th album feels coherent and offers first-rate black metal. The album welcomes a new drummer,Menthor, in the place of Garghuf and a new rhythm guitarist ZarZax.